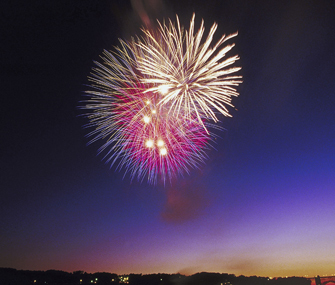 This Fourth of July, Americans will celebrate with the sights and sounds of fireworks. While we love the pyrotechnics, it’s important to remember that our patriotic midsummer spectacular is no holiday for many of our pets. We humans may ooh and aah over every explosion, but our pets are very often frightened out of their wits. They’ll spend the holiday hiding under the bed or in the basement, cowering, shaking, drooling and seeking safety and comfort. Scared pets have been known to jump out of apartment windows, leap over or dig under fences, or chew their skin until it’s raw. They may also bolt out an open door and become lost. Not all dogs are afraid of fireworks. Our Golden Retriever, Shakira, wouldn’t flinch if a keg of gunpowder exploded next to her. Shop vacs, lawn mowers, grass trimmers, motorcycles, thunderstorms and fireworks elicit but a yawn. On the other hand, Quixote, our Yorkie/Pomeranian/Chihuahua mix, treats loud sounds as if the grim reaper were calling — and there’s no way he’s going to answer. When it comes to big noises, this dog is a scaredy-cat. The best defense against Fourth of July problems is a good offense. While comforting your scared pet may seem like the right thing to do, it’s not. Don’t reward the fear. If you remain calm and don’t baby your dog or cat, he will be closer to learning how to handle loud noises. Instead, turn a potentially negative experience such as fireworks into something rewarding. When a negative experience comes with tasty treats, your pet may be more likely to tolerate it or maybe even welcome it. This works best when started as a puppy, but don’t give up hope if your dog is already an adult: New behaviors can be learned. Ideally, you would prepare your pet for the noise of the Fourth by exposing him to recordings of fireworks (search YouTube for fireworks shows). Start by playing videos or recordings at a low volume — recognizing how acute a pet’s hearing is — and give praise and treats while you and your pet listen to the noise. It’s a party! Start by playing the recording for five minutes; increase the volume and duration during subsequent sessions. Give your dog or cat really tasty treats while you listen to the fireworks. This teaches him that the loud noises come with yummy snacks — and hopefully makes them more tolerable. If you’re short on time, skip right to the treats. Have a supply of tasty snacks ready when the fireworks start; use them to reward your cat or dog for staying calm and cool during the show. If you’re not able to be with your pet during the fireworks display — or if he’s too scared to stay in the room with you — be sure to provide a safe hiding space inside your home. Dogs and cats who are comfortable in crates often find them a good place to ride out the noise, especially if the crate is put in a quiet, darkened part of the house. Of course, if you find that treating your pet and exposing your animal to the sounds of fireworks doesn’t ease his anxiety, begin planning in advance for the next explosive holiday. Some pets are so unhinged by noise that veterinarian-prescribed tranquilizers are needed to help keep them calm. Also talk to your veterinarian about other calming techniques. Some alternative-care veterinarians may recommend herbal products, while others can show you acupressure and massage techniques to help keep pets more calm.